While most critical accounts of the opening thirteen minutes of Robert Siodmak’s 1946 adaptation of the Ernest Hemingway short story (originally published in 1927) stress its painstakingly accurate transposition of the original narrative—minus some profanity and a racial epithet or three—this isn’t exactly, or entirely, the case. The other significant departure from the short story occurs at the end of the sequence. 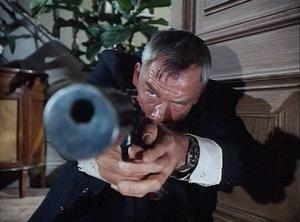 Whereas in the story Nick Adams returns to the restaurant, nonplussed by Andreson’s fatalistic non-response to the news that he’s been fingered for a hit, in the film we see the assassination take place—but not before Siodmak takes his time with the scene, lingering on Lancaster’s face to register the resignation. As the killers make their way up the stairs, the cutting and music pick up the pace, reaching a thunderous climax as the bedroom door flies open and the killers unload a volley of shots into the Swede. We see his death metonymically, as it were: a hand clutches a bed rail, then falls away limp, inert. The rest of the film unfolds in a series of flashbacks—the labyrinthine structure earned it a reputation as the Citizen Kane of films noir—as insurance investigator Edmund O’Brien attempts to piece events together. 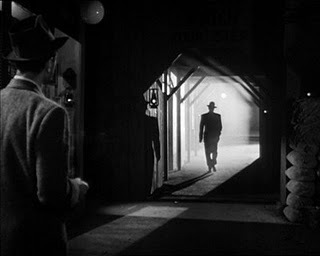 Though the subsequent narrative, which owes a clear debt to Billy Wilder’s Double Indemnity (1944) for its insurance office milieu, may not preserve the minimalist exactitude of its opening, Siodmak and Bredell’s camerawork and staging never slacken. 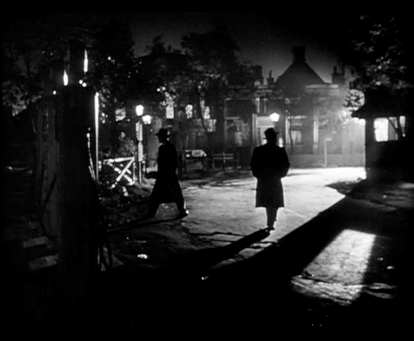 Drawing on his German Expressionist background, Siodmak continues to fill the frame with shadows and murk. He also reveals a particular fondness for tracking and high-angle shots. Wrapping up its narrative, after an almost Shakespearean climax that finds several characters’ bodies littering the scene, Siodmak’s film veers into bathos. Back at the office, Reardon (O’Brien) and his superior discuss the net effect the discovery of the criminal conspiracy and its undoing will have. Kenyon, Reardon’s boss, informs him: “Owing to your splendid efforts the basic rate of The Atlantic Casualty Company – as of 1947 – will probably drop one-tenth of a cent.” That is to say, this labyrinth of larceny and lust, a “limited liability” if ever there were one, amounts to next to nothing, the proverbial “hill of beans,” compared to the larger economic and corporate forces at work upon the nation as a whole. “Cool” describes to perfection the new breed of “professionals.” Marvin’s Charlie Strom dresses like a businessman, carries a briefcase and sports dark glasses. His partner, Lee (Clu Gulager), is a “health nut,” and a bit more impetuous than the calculating Charlie. 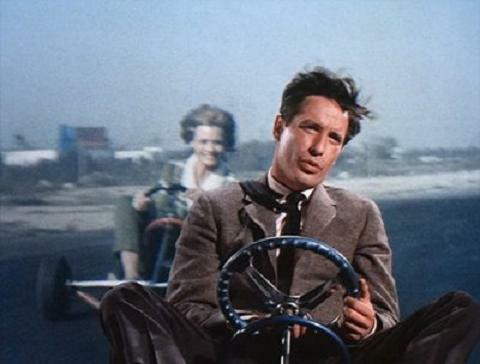 In ways, they are an “odd couple,” embodying opposite tendencies; nevertheless, they both represent varieties of the “New Sentimentality” that future Bonnie and Clyde scribes Robert Benton and David Newman laid out in an influential article appearing in Esquire the same month as the film’s release: “One of the definitions of New Sentimentality is that it has to do with you, not what you were told or taught, but what goes on in your head, really, and in your heart, really.” Beneath this tablet of new values, prizing the “rugged” individual in the face of the body politic, can be found the mainspring that operates throughout Bonnie and Clyde: the propensity for brutal violence. For Charlie and Lee, it’s more than a business tactic, it’s a way of life. No longer shunted to secondary roles, Siegel’s duo are now the engine that drives the story. The film lacks any prototypical force for law and order, no police lieutenant or insurance investigator, however feckless. The reason for piecing the puzzle together has changed, as well. Granted, there’s a million-dollar heist at issue (and money certainly is the major motivator), but the sole item that really gets under Charlie’s skin—and here the film hearkens back to the Hemingway story—is the utter lack of affect behind North’s acceptance of his own assassination. “You see, the only man that’s not afraid to die is the man that’s dead already,” Charlie says. And nothing can kill a man’s will to live quite as effectively as a fatal female. How appropriate in retrospect that, in his final film role as gang leader Jim Browning, Ronald Reagan should play, for the first and only time in his career, the heavy! 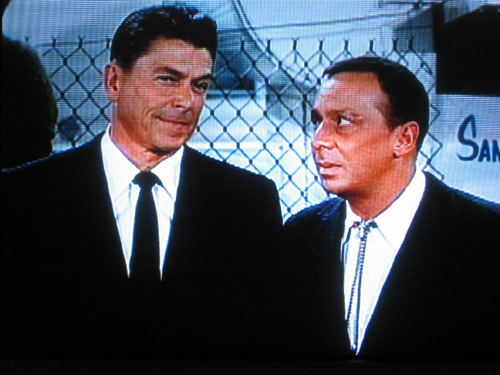 Like his character, Reagan, too, was on the threshold of “going legit”: first as governor of California, then as two-term President of the United States. Trafficking between Hollywood and DC was hardly new. Earlier that decade, JFK had been the first living Executive Officer to become the subject of a film (PT 109  starring Cliff Robertson). Reagan simply reversed the direction. “Improving” on the earlier version, Siegel’s film ends with every major character dead. In the 1946 version, O’Brien, of course, “prevailed,” and Ava Gardner’s Kitty Collins faced the prospect of either a life sentence or the hot seat, despite her best efforts at getting Big Jim to declare her innocent. (And providing probably the film’s best line: “Don’t ask a dying man to lie his soul into hell.”) Far from the shadowy finale Siodmak staged, Charlie Strom dies in an ignoble sprawl amid a verdant, sun-drenched suburban lawn. Take 2.5: Worth mentioning for the film-historical minded, the Criterion edition of these films also includes, as a key supplement, the 1956 student film version of the Hemingway story co-written and co-directed by Andrei Tarkovsky while at the VGIK. It, too, plays like a (more) literal transcription of the story, this time including the profanity and racial slurs. Formally (and how can one not invoke that term when discussing one the great Russian masters), the short is no new shakes, very bares bones in the set and prop department, the sole directorial flourish a canted-angle POV shot inhabiting the bound-and-gagged Nick Adam’s perspective. Also notable, Tarkovsky eschews the urgency (and musical insistence) of Siodmak’s version, indulging instead in the deliberate, nearly languorous, pacing for which he would soon become famous (some might say infamous). This entry was posted in film, movie reviews and tagged andrei tarkovsky, angie dickinson, ava gardner, billy wilder, bonnie and clyde, burt lancaster, charles mcgraw, citizen kane, cliff robertson, clu gulager, david newman, don siegel, double indemnity, dragnet, edmond o'brien, elwood bredell, ernest hemingway, film noir, german expressionism, goodfellas, jfk assassination, joe pesci, john boorman, john cassavetes, john travolta, johnny staccato, lee marvin, made-for-tv movie, mark hellinger, marshall mcluhan, miklos rozsa, nbc, nick adams, orson welles, point blank, pt 109, pulp fiction, ray liotta, robert benton, robert siodmak, ronald reagan, samuel l. jackson, the killers, touch of evil, universal studios, vgik, walter schumann, william conrad. Bookmark the permalink. Will check this out for sure, thanks! My son wad required to read this insulting story in high school. He immediately notified me of the racial slurs-n words. I then immediately reported this to the principal and this story was removed from the require reading. By the way, we are African American. No one should be subjected to this regardless of the author or how good the story is considered to scholars. It is wrong and unfair.